Sarah Morgan from the Discover Animals team recently tested a new range of luxury pet grooming products from Scruffs®. Find out how Sarah – and her two pooches – got along in their review here…. In addition to being our best friends and dear family members, pet dogs come in all shapes and sizes. 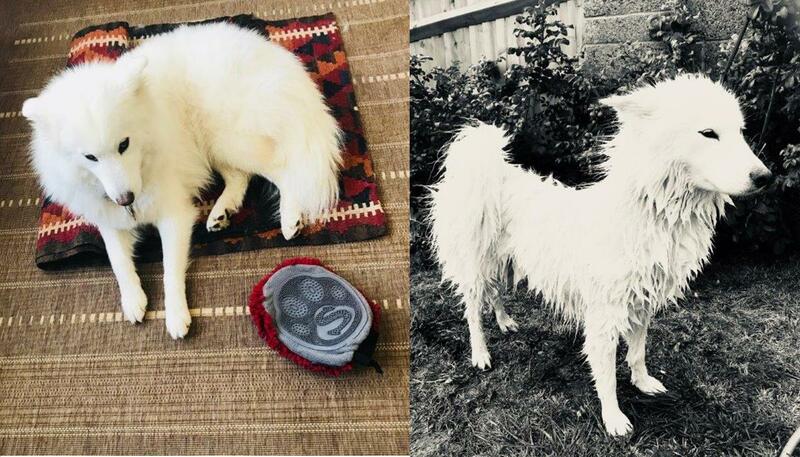 Their temperaments and habits vary enormously, and I feel blessed to be owned by two cross-breed rescues; a black collie/spitz and a white husky samoyed. At home we are on good terms with the hoover, but have loads of urban foxes in nearby parks and gardens, which equals plenty of rolling in stink – which is far from welcome back at the house. So, I leapt at the chance to test luxury pet products by Scruffs® with some handy new additions to their popular Noodle Dry Mat. 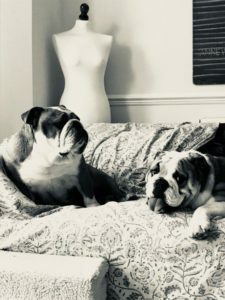 Our makeshift laboratory was in the clifftop garden at Seadogs where my pair like to hang out with Banksy, the resident bulldog, who has very different fur and grooming preferences, along with his young friend Oscar a bouncy guest (who hasn’t made his mind up yet). 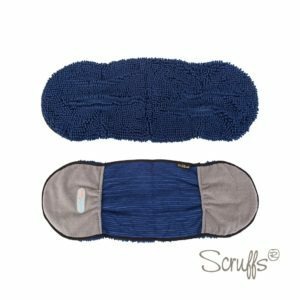 Scruffs® Noodle Drying Mitts & Towels are super absorbent to soak up excess moisture. 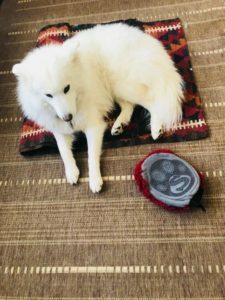 Luna the Samoyed often takes a whole day to dry off after her shampoo, so I packed my usual sports towel in case the test backfired, but we didn’t need it at all. Scruffs® material is made from gazillions of textured, ultrafine strands woven together to provide a surface area that exceeds the actual size of the product. This creates a kind of super-absorbency, soaking up water like a thirsty sponge and improving the overall airflow, so that your drying time is massively reduced. 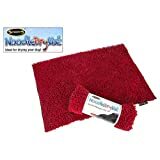 A micro-fibre chenille fabric produces the loop-like ‘noodles’. I used a roomy two-handed blue towel on Luna and it kind of reminded me of a large cosy oven mitt. I rubbed her down with front and back, then up and under to get at her enormous culottes and all the tummy floof. She has been moulting in readiness for her fullest winter regrowth so this actually helps the shedding by loosening the undercoat really gently. 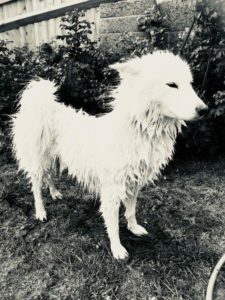 I could feel the weight of the water being absorbed, yet the towel drew most of the moisture away from her gigantic tail and chest ruff. It was a windy afternoon and she was 95% dry within a couple of hours (a blow out at the groomers with a machine can take about 45 minutes and she’d far rather be in a garden messing around making this a game rather than a chore standing on a table). I had expected to need something else for Ramsey, but the double ended towel was still working its magic on his lighter coat and he really couldn’t get enough of his rub down (this self-confessed grooming addict likes to preen for his #fluffybuttfriday poses, you know the sort). This would be ideal hanging over a radiator when the rain and snow builds up. 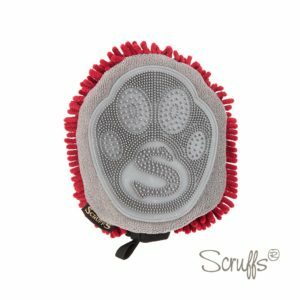 For shorter haired breeds, the Scruffs® 2 in 1 Drying/Grooming mitt has a rubberised pattern on one end, and the bulldogs really enjoyed this for a back-scritch feeling – which helps to capture their shorter, firmer stray hairs. For dogs who can’t stand any type of fuss, the original drying matt is ideal because it is portable for home garden or car and they can just lie down on it without even noticing that it is drying them. We all liked the time-saving performance and I was especially keen on the potential to economise on luxury groomer visits, which we can now reserve for high days and holidays. 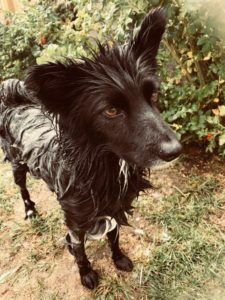 There are some great comments on the Amazon feedback, including; “great at absorbing mud and water off the dog, easy to wash and quick drying”. This Manchester-based company has attractive prices with lovely colours, especially the burgundy red!